Earth radius is the distance from the Earth's center to its surface, about 6,371 kilometers (3,959 mi). This length is also used as a unit of distance, especially in astronomy and geology, where it is usually denoted by R_\oplus. This article deals primarily with spherical and ellipsoidal models of the Earth. See Figure of the Earth for a more complete discussion of the models. The Earth is only approximately spherical, so no single value serves as its natural radius. Distances from points on the surface to the center range from 6,353 km to 6,384 km (3,947–3,968 mi). Several different ways of modeling the Earth as a sphere each yield a mean radius of 6,371 kilometers (3,959 mi). While "radius" normally is a characteristic of perfect spheres, the term as used in this article more generally means the distance from some "center" of the Earth to a point on the surface or on an idealized surface that models the Earth. It can also mean some kind of average of such distances, or of the radius of a sphere whose curvature matches the curvature of the ellipsoidal model of the Earth at a given point. An early report on the circumference of the Earth was given by Aristotle at 400,000 stadia. The first scientific estimation of the radius of the Earth was given by Eratosthenes about 240 BC. Estimates of the accuracy of Eratosthenes’s measurement range from within 2% to within 15%. Scale drawing of the oblateness of the 2003 IERS reference ellipsoid. The outer edge of the dark blue line is an ellipse with the same eccentricity as that of the Earth, with north at the top. For comparison, the outer edge of light blue area is a circle of diameter equal to the minor axis. The red line denotes the Karman line and the yellow area, the range of the International Space Station. Earth's rotation, internal density variations, and external tidal forces cause it to deviate systematically from a perfect sphere. Local topography increases the variance, resulting in a surface of unlimited complexity. Our descriptions of the Earth's surface must be simpler than reality in order to be tractable. Hence, we create models to approximate the Earth's surface, generally relying on the simplest model that suits the need. In the case of the geoid and ellipsoids, the fixed distance from any point on the model to the specified center is called "a radius of the Earth" or "the radius of the Earth at that point". It is also common to refer to any mean radius of a spherical model as "the radius of the earth". On the Earth's real surface, on the other hand, it is uncommon to refer to a "radius", since there is no practical need. Rather, elevation above or below sea level is useful. Regardless of the model, any radius falls between the polar minimum of about 6,357 km and the equatorial maximum of about 6,378 km (≈3,950 – 3,963 mi). Hence, the Earth deviates from a perfect sphere by only a third of a percent, sufficiently close to treat it as a sphere in many contexts and justifying the term "the radius of the Earth". While specific values differ, the concepts in this article generalize to any major planet. where \omega is the angular frequency, G is the gravitational constant, and M is the mass of the planet. For the Earth q−1 ≈ 289, which is close to the measured inverse flattening f−1 ≈ 298.257. Additionally, the bulge at the equator shows slow variations. The bulge had been declining, but since 1998 the bulge has increased, possibly due to redistribution of ocean mass via currents. The variation in density and crustal thickness causes gravity to vary on the surface, so that the mean sea level will differ from the ellipsoid. 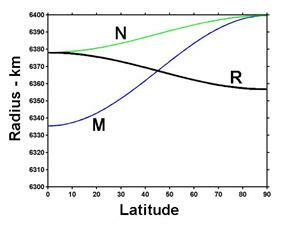 This difference is the geoid height, positive above or outside the ellipsoid, negative below or inside. The geoid height variation is under 110 m on Earth. The geoid height can change abruptly due to earthquakes (such as the Sumatra-Andaman earthquake) or reduction in ice masses (such as Greenland). Not all deformations originate within the Earth. The gravity of the Moon and Sun cause the Earth's surface at a given point to undulate by tenths of meters over a nearly 12 hour period (see Earth tide). Al-Biruni's (973–1048) method for calculation of the Earth's radius improved accuracy. Given local and transient influences on surface height, the values defined below are based on a "general purpose" model, refined as globally precisely as possible within 5 m of reference ellipsoid height, and to within 100 m of mean sea level (neglecting geoid height). Additionally, the radius can be estimated from the curvature of the Earth at a point. Like a torus, the curvature at a point will be largest (tightest) in one direction (North-South on Earth) and smallest (flattest) perpendicularly (East-West). The corresponding radius of curvature depends on the location and direction of measurement from that point. A consequence is that a distance to the true horizon at the equator is slightly shorter in the north/south direction than in the east-west direction. In summary, local variations in terrain prevent the definition of a single absolutely "precise" radius. One can only adopt an idealized model. Since the estimate by Eratosthenes, many models have been created. Historically, these models were based on regional topography, giving the best reference ellipsoid for the area under survey. As satellite remote sensing and especially the Global Positioning System rose in importance, true global models were developed which, while not as accurate for regional work, best approximate the Earth as a whole. The following radii are fixed and do not include a variable location dependence. They are derived from the WGS-84 ellipsoid. The value for the equatorial radius is defined to the nearest 0.1 meter in WGS-84. The value for the polar radius in this section has been rounded to the nearest 0.1 meter, which is expected to be adequate for most uses. Please refer to the WGS-84 ellipsoid if a more precise value for its polar radius is needed. The radii in this section are for an idealized surface. Even the idealized radii have an uncertainty of ± 2 meters. The discrepancy between the ellipsoid radius and the radius to a physical location may be significant. When identifying the position of an observable location, the use of more precise values for WGS-84 radii may not yield a corresponding improvement in accuracy. The symbol given for the named radius is used in the formulae found in this article. The Earth's equatorial radius a, or semi-major axis, is the distance from its center to the equator and equals 6,378.1370 kilometers (3,963.1906 mi). The equatorial radius is often used to compare Earth with other planets. The Earth's polar radius b, or semi-minor axis, is the distance from its center to the North and South Poles, and equals 6,356.7523 kilometers (3,949.9028 mi). Maximum: The summit of Chimborazo is 6,384.4 km (3,968 mi) from the Earth's center. Minimum: The floor of the Arctic Ocean is ≈6,352.8 kilometers (3,947.4 mi) from the Earth's center. where a and b are, respectively, the equatorial radius and the polar radius. This is the radius that Eratosthenes measured. If one point had appeared due east of the other, one finds the approximate curvature in east-west direction. It is possible to combine the meridional and normal radii of curvature above. A sphere being a gross approximation of the spheroid, which itself is an approximation of the geoid, units are given here in kilometers rather than the millimeter resolution appropriate for geodesy. For Earth, the mean radius is 6,371.0088 kilometers (3,958.7613 mi). Earth's authalic ("equal area") radius is the radius of a hypothetical perfect sphere which has the same surface area as the reference ellipsoid. The IUGG denotes the authalic radius as R_2. where e^2=(a^2-b^2)/a^2 and A is the surface area of the spheroid. For Earth, the authalic radius is 6,371.0072 kilometers (3,958.7603 mi). Another spherical model is defined by the volumetric radius, which is the radius of a sphere of volume equal to the ellipsoid. The IUGG denotes the volumetric radius as R_3. For Earth, the volumetric radius equals 6,371.0008 kilometers (3,958.7564 mi). For integration limits of [0...π/2], the integrals for rectifying radius and mean radius evaluate to the same result, which, for Earth, amounts to 6,367.4491 kilometers (3,956.5494 mi). about 6,367.445 kilometers (3,956.547 mi). The best spherical approximation to the ellipsoid in the vicinity of a given point is given by the osculating sphere. Its radius equals the Gaussian radius of curvature as above, and its radial direction coincides with the ellipsoid normal direction. This concept aids the interpretation of terrestrial and planetary radio occultation refraction measurements. ^ For details see Figure of the Earth, Geoid, and Earth tide. ^ There is no single center to the geoid; it varies according to local geodetic conditions. ^ In a geocentric ellipsoid, the center of the ellipsoid coincides with some computed center of the earth, and best models the earth as a whole. Geodetic ellipsoids are better suited to regional idiosyncrasies of the geoid. A partial surface of an ellipsoid gets fitted to the region, in which case the center and orientation of the ellipsoid generally do not coincide with the earth's center of mass or axis of rotation. ^ The value of the radius is completely dependent upon the latitude in the case of an ellipsoid model, and nearly so on the geoid. ^ This follows from the International Astronomical Union definition rule (2): a planet assumes a shape due to hydrostatic equilibrium where gravity and centrifugal forces are nearly balanced. ^ East-west directions can be misleading. Point B, which appears due East from A, will be closer to the equator than A. Thus the curvature found this way is smaller than the curvature of a circle of constant latitude, except at the equator. West can exchanged for east in this discussion. ^ N is defined as the radius of curvature in the plane which is normal to both the surface of the ellipsoid at, and the meridian passing through, the specific point of interest. ^ NASA's Grace Finds Greenland Melting Faster, 'Sees' Sumatra Quake, December 20, 2005, Goddard Space Flight Center. ^ a b c Moritz, H. (1980). Geodetic Reference System 1980, by resolution of the XVII General Assembly of the IUGG in Canberra. ^ a b Snyder, J.P. (1987). Map Projections – A Working Manual (US Geological Survey Professional Paper 1395) p. 16–17. Washington D.C: United States Government Printing Office.